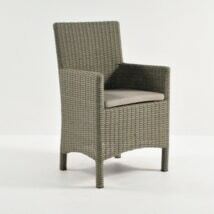 The Petra Wicker Dining Arm Chair (Java) is a counterpart to the Petra Side Chair, both ideal for use indoors or out. 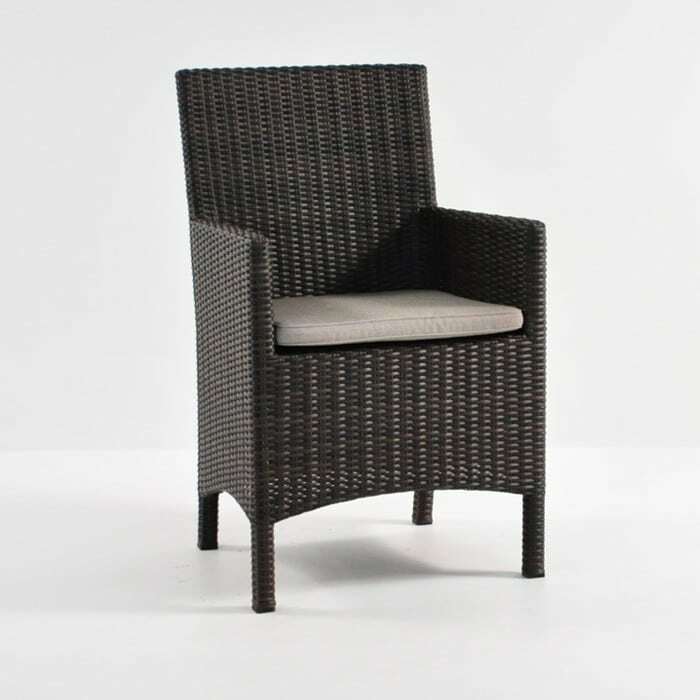 With a simplistic linear design, this all weather arm chair is supported by a soft Sunbrella® cushion, the Petra collection follows European influences, adding style to any area. Team up either with our teak, wicker or concrete dining tables, depending on what look you wish to create. Teak Warehouse’s Petra Wicker Dining Arm Chair (Java) is made out of hardy, strong, and beautiful Viro® All Weather Wicker, a product revered for its eco-friendly properties, and extra durable fabric. Viro® products are award-winning, each blend of wicker has been through dyed and protected from Ultraviolet rays with its unique polyethylene synthetic fabric. This color, Java, is a beautiful rich chocolate brown, perfect for warming up a cool space and adding a delightful charm to your home. 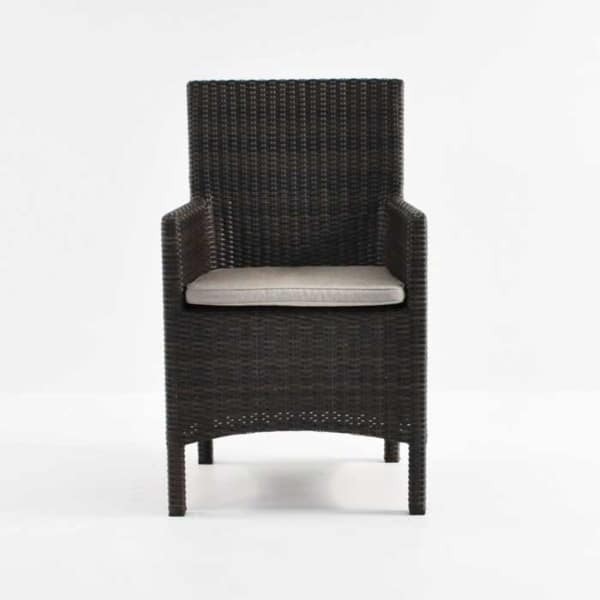 Each Petra Wicker Dining Arm Chair (Java) comes with a free Sunbrella® pad, filled with QuickDry® foam, meaning that your chairs can be left out all year round without worry about damage from the harsh elements. 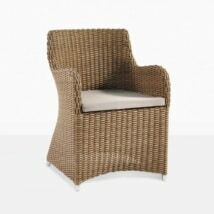 Teak Warehouse is proud to host a vast collection of beautiful furniture ideal for outdoor use. 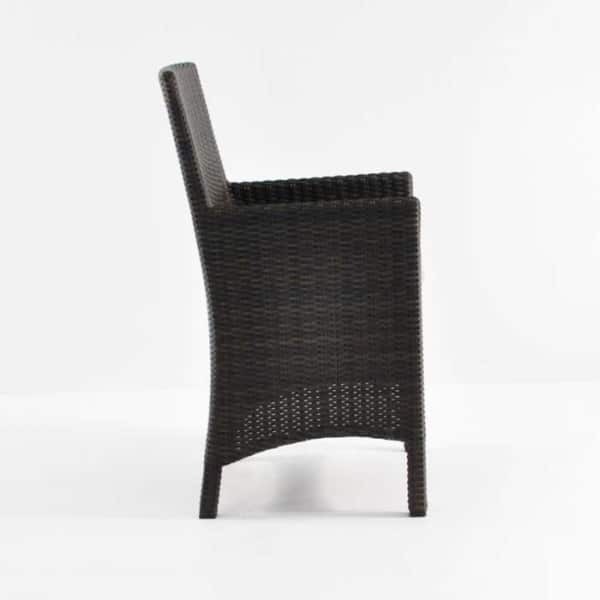 As well as Viro®, we also carry Rehau® and new Ecolene® furniture, offering different options for weaves and colors of your All Weather Wicker. And if you’re interested in introducing some other materials in with your wicker collection, or just after something different, then be dazzled by the amazing A-Grade Teak and rustic Reclaimed Teak tables, chairs, deep seating, loungers and much more. We also have cool and contemporary Raw Concrete Tables, Benches, Stools and Planters as well as a fabulous collection of Batyline® and Textilene® mesh sunbeds, dining chairs and relaxing chairs. Teak Warehouse has over 700 luxury products under one roof, and all at wholesale prices! If your space is stark and you wish to warm it up; try one of our large Pedestal Table surrounded by 8 Petra Wicker Dining Arm Chair (Java) for a cozy place to have long lunches and dinners with friends. Place a large 10 or 11ft Sunbrella Umbrella overhead in either Taupe or Canvas, depending what color cushion you choose. Orchestrating an area with a modern edge? 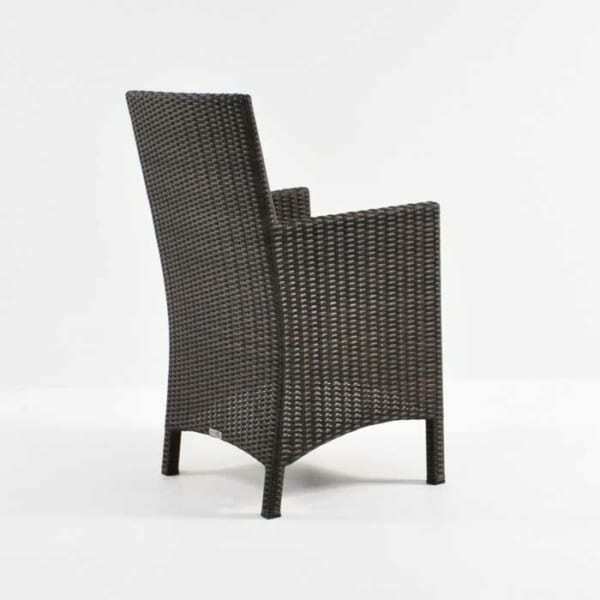 Place two Petra Wicker Dining Arm Chair (Java) on either end of a Raw Concrete or Stainless Steel and Teak Fixed Table, completing the look with the matching Side Chair lining the sides of your gorgeous contemporary table. If you need an umbrella for this area, why not look into one of our grand rectangular Cantilever Umbrellas for the final flourish in an already fabulous setting. This all weather arm chair is a great addition to the porch with wide, welcoming arms – this is a chair you can fall into! Match with an Accent Table or Box in the same weave of wicker, place at the side to place a delicious drink or your favorite book – ideal for warm summer nights after a long day at work. Our Petra range is made from all weather Viro® wicker on a powder coated aluminium frame, ensuring a long life and quality assurance. Choose from stylish Kubu Gray or rich Antique Java (as showcased here) to suit your space and taste! This European outdoor wicker dining chair adds style to any outdoor area. Mix and match with our teak or concrete dining tables. This chair is also available in a side chair. Cushion included. Call one of our knowledgeable sales staff now to discuss different options! 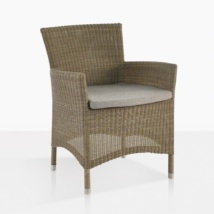 The Petra Wicker Dining Arm Chair (Java) is available now for purchase and delivery!